Truth be told, I’m usually a cartoon humbug. But from the opening frame of the new Disney/Pixar movie Wall-E — a view of Earth from space, but not our familiar blue and green home, instead the planet is brown and gray and orbited by a thick ring of galactic trash — I realized that this movie had a message above and beyond the usual gooey, goofy animated fare. It’s the year 2775 and Earth has been abandoned by everyone and everything except for a lone robot and a swarm of immortal cockroaches. The iconic New York City skyline is dwarfed by skyscrapers of trash, and Wall-E, short for Waste Allocation Load Lifter – Earth-Class, is the architect. He spends his days scooping waste into his trash-compactor stomach, burping out cubes and stacking them into towering piles. Humans may have been heinous waste-mongers (encouraged by the ubiquitously advertised “Buy N Large” bulk empire), but not Wall-E. Every morning the oddly endearing robot recharges using solar power (the familiar Mac power-on chime when he’s fully charged got a lot of laughs during my screening) and he’s also a diligent recycler, reusing tire treads and parts from other defunct robots when he needs repairs. In this manner, Wall-E has lived sustainably while cleaning up our mess for more than 700 years. All that time alone has made Wall-E sentimental. As he sifts through our trash he finds treasures — a rubber ducky, an iPod, bubble wrap, a Rubik’s cube — and takes them back to his Christmas-light-lit lair. Wall-E’s nostalgia sparked my own, not for the things he finds but for the healthy blue sky and growing green Earth missing from Wall-E’s bleak world. Wall-E shows Eve his treasure collection in a scene from the new Disney/Pixar animated film. But one day everything changes. Wall-E is joined by a visitor from space, a sleek robot named Eve. 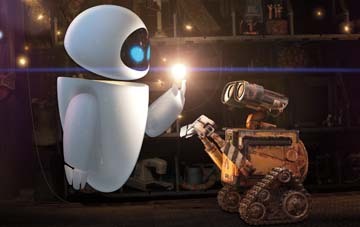 Wall-E falls instantly in robot-love and when Eve departs on her spaceship, he hitches a ride. After the rocket punches through Earth’s orbiting trash into space, it flies by a montage of space icons — sputnik, the golden LEM and Neil Armstrong’s unwaving lunar flag — on its way to the Axiom, the colossal spaceship home to the even more colossal human race. Thanks to hover chairs — “No need to walk!” — and liquid meals like cupcake-in-a-cup, this version of mankind has become grotesquely obese and mentally, more robotic than the heroic Wall-E.
Wall-E’s nonstop adventure and superb Charlie Chaplin-style physical comedy (there’s almost no dialogue) will certainly appeal to kids, but the flick has a lot for adults too. Wall-E’s commentary on our waste woes and the cultural quirks that contribute to our environmental problems is razor-sharp: In an old clip from 2110, the world’s head waste-monger dismisses the need to become more sustainable, stubbornly declaring, “We must stay the course!” In fact, Wall-E is so sharp that by the end, I was relieved to be watching a cartoon where a robot’s love and eternal optimism can save Earth from a bleak future that is all too real. Wall-E opens in theaters today. To research creating the movie’s characters, Wall-E’s animation team studied robots and rovers at NASA. Disney/Pixar and NASA have also teamed up as educational partners to promote space exploration to Wall-E’s younger fans. Soon animated shorts of Wall-E will appear in classrooms everywhere to teach kids about outer space as well as more earthly environmental issues. Visit the NASA and NASA Kids' Club websites to see Wall-E in action. Mary Caperton Morton is a freelance writer and currently an intern at Geotimes.